The name does kinda say it all, doesn’t it? On this week’s episode of the B&H Photography Podcast, we speak with legendary rock ’n’ roll photographer Mick Rock. Despite his incredible body of work and numerous iconic photos, Rock’s philosophy on photography might best be summed up with a comment from this episode, “The reality is, it’s not that complicated.” For this episode we traveled to Rock’s home studio, and he graciously invited this “dodgy-looking bunch” in to talk about the ... See More beginning of his career, his working style, the bio-documentary “SHOT! The Psycho-Spiritual Mantra of Rock,” and the many photos and album covers he created for the likes of Syd Barrett, David Bowie, Lou Reed, Blondie, Queen, Rory Gallagher, Joan Jett, Madonna, and others. We also discussed his recent work with Lana Del Rey, Karen O, the GUCCI brand, and how he approaches an advertising campaign compared to a rock ’n’ roll shoot. Our conversation casually bounced between topics, but often returned to Rock’s ability to grasp the photographic moment, whether that moment be in a studio, at a concert or, as in many of his most intriguing images, while hanging out with the musicians offstage. Rock downplays his technical skills, but we do talk a bit about gear and, when pressed on how he could create four decades of memorable music photos, he stated, “I’ve always loved my subjects.” The same can be said about us, so please tune in for this wonderful conversation...and don't forget to join the B&H Photography Podcast Facebook group. 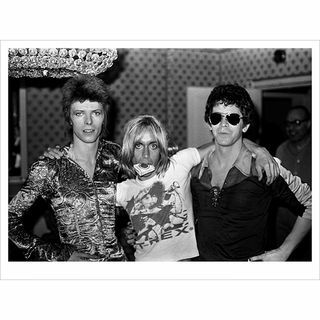 Guest: Mick Rock Photograph © Mick Rock The views and opinions expressed in this podcast are those of the individual guests and do not necessarily represent the views of B&H Photo. The salty language and "rock-n-roll content" may offend some. Listen at your own discretion.